Different ZnS nanostructures synthesized by a chemical solution process were deposited on the glass substrate by dip coating technique. The effect of the sol-pH variation on the surface morphology, crystalline quality, optical band gap, and photoluminescence of the ZnS nanosphere, nanorod and mixed hexagonal cubic and rectangular-like nano-grains were investigated. It was found that the triethanolamine/ethanolamine played a key role to get desired nanostructure quality with different surface morphology. All nanostructures, derived in acidic and basic medium showed mixed cubic and hexagonal crystalline structure with preferred orientation along (111) plane of predominant cubic phase without oxidation. Nanospherical grains, sharply increased in size observed in acidic medium, whereas nanorods and mixed hexagonal, cubic and rectangular-like grains, slightly increased and then decreased in size, observed in basic medium with increased pH. The increased/decreased in average crystallite size was confirmed by reduced/enhanced dislocation density and micro strain. Comparatively, the band gap (Eg) of the nano-grains, reduced by pH derived in acidic medium was higher than those derived in basic medium. Comparatively, the higher surface defects related emission was observed in nanostructures derived in acidic medium than those derived in basic medium, whereas a higher green emission was observed in nanostructures fabricated at basic medium compared with the nanostructures synthesized in acidic medium. 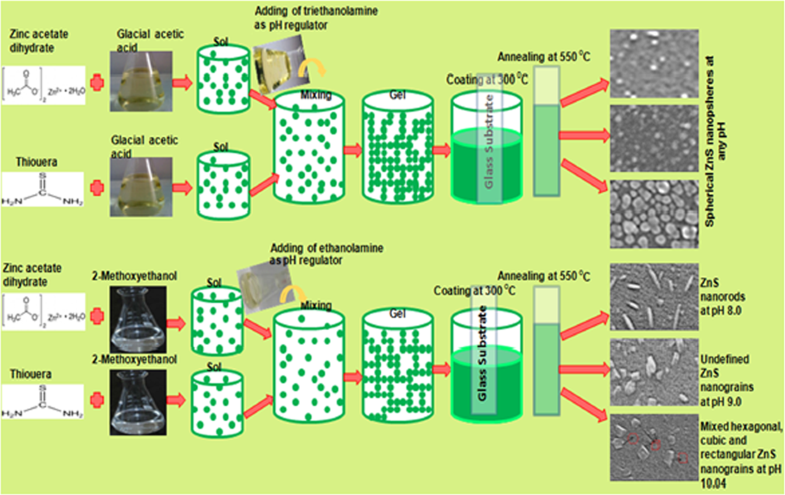 The results showed better crystalline quality in nano-grains derived at acidic medium than those derived at basic medium, whereas better optical quality in nanostructures derived at basic medium compared with the nanostructures derived at acidic medium. 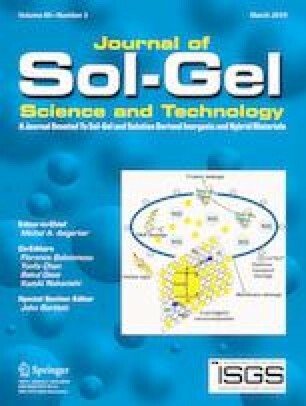 The observed characteristics are highly attractive for solar cells and optoelectronic applications. To get ZnS solution by chemical route, using glacial acetic (solvent) acid with triethanolamine (pH regulator) leads to the spherical ZnS nano-grains at any pH value, whereas using 2-methoxyethanol (solvent) with ethanolamine (pH regulator) brings about nanorods, undefined and mixed hexagonal, cubic and rectangular ZnS nano-grains at pH 8.0, 9.0, and 10.04, respectively. Growth of chemically deposited different ZnS nanostructures. Formation of ZnS nanorods without using any capping agent at pH 8.0. A higher crystalline quality in ZnS nanostructures derived in acidic medium than the others. Comparatively a better optical quality in the ZnS nanostructures derived in basic medium than the others. Enhancement of the optical constants of the ZnS nanostructures as growthing medium shifted from acidic to basic. Financial support from the Scientific Research Project Commission of Harran University (HUBAK) under Project No. 18062 is gratefully acknowledged.